Since 2001 Cambodia has benefited from an exceptional trading advantage, granted by the European Union thanks to an initiative known as “Everything But Arms” (EBA). This provides the possibility of exporting to Europe without quotas or customs duties. The advantage was given to a group of countries in the process of development and transition toward democracy. The intention of the European Commission was to help “least developed countries” to escape from poverty but also — a parallel, mandatory, criteria — to progress on the path to democracy and respect for human rights. Since its creation, the EBA program has proved vital for Cambodia, whose economy is based on the export-oriented clothing industry (40 percent of GDP and 60 percent of exports). The European Union buys 40 percent of the clothes produced in Cambodia, through leading international brands. In September, the European Union decided to begin the process of suspending Cambodia’s EBA participation because of the totalitarian drift of the regime in Phnom Penh. Under the leadership of Prime Minister Hun Sen — a former Khmer Rouge member who has been in power since 1985 — the only opposition party in parliament, the CNRP, was arbitrarily dissolved in late 2017 and its leader, Kem Sokha, arrested, while civil society organizations and the independent media were shut down. This set the scene for rigged elections in July 2018, with 100 percent of the seats in the National Assembly being won by the ruling party. Such a result demonstrates the return to a Communist-style, single-party system which the Paris Accords of 1991 intended to banish. Beyond applying pressure for the respect of democratic principles and human rights, this threatened European sanction could kill two birds with one stone by also triggering healthy economic reforms through better governance. Cambodia is, according to Transparency International, one of the most corrupt countries in the world and, according to the World Bank, one of the poorest. The correlation between corrupt governance and poverty no longer needs to be demonstrated; the former leads directly to the latter.This totalitarian drift violates the conditions to benefit from EBA, and obliged the European Union to punish the Phnom Penh regime by suspending it. But the suspension will only be effective after a delay of 12 months, giving Hun Sen time — supposing that he has the political will — to return to the path of democracy. The most flagrant evidence of poor governance doesn’t just lie in the systematic pillage of national wealth by an elite which clings to power indefinitely. It also consists in poor strategic decisions taken by irresponsible leaders who are incapable of a clear and coherent vision for the future of their country. The weight of the clothing industry in Cambodia and the country’s dependence on this single industry are a striking example of this poor governance. Since the start of the process of globalization and the return of peace in the 1990s, an industrial revolution has taken place in Cambodia, driven by a clothing industry characterized by low added value and low salaries (the basic salary of a Cambodian worker is currently $170 per month). But over the last 20 to 25 years, instead of using this industry as a basis from which to diversify the economy toward higher added-value industries, the regime has allowed the national economy to become ever more dependent on a single industry. This negligence has aggravated Cambodia’s relative poverty compared to neighboring countries. Worse, productivity within this clothing industry remains very low, meaning Cambodia can’t compete internationally without the commercial advantages provided by the European Union. Weak productivity itself reflects poor governance in the form of dilapidated public and social services, notably in health, education and professional training. Cambodia’s lack of industrial competitivity results from the corruption and negligence lamented by investors, who are faced with poor road and port infrastructure, administrative costs that include bribes to be paid at every level, exorbitant prices for state-supplied electricity, and so on. 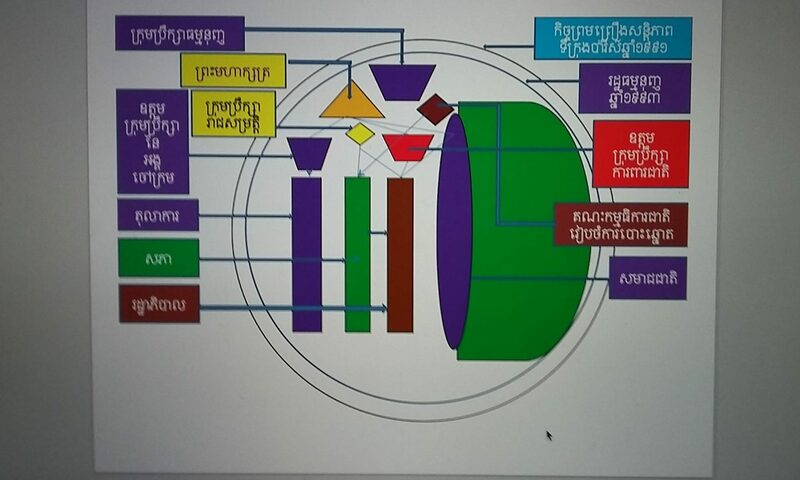 If, to be able to survive, Cambodia’s clothing industry, a pillar of the national economy, must rely indefinitely on European trading advantages to resist competition from others who lack them, then the European Union will be subsidising and financially rewarding, through the trading system, the corruption and poor governance of the regime. This raises the question of the effectiveness of international aid, which starts from good intentions, but has perverse effects which may do the recipient country more harm than good by helping to maintain anachronistic structures. Faced with Hun Sen, who is holding his people hostage as part of a campaign to emotionally blackmail the international community, Europe must hold firm. The dictator has feet of clay and his days are numbered in the absence of imperative and urgent reforms. Sam Rainsy is an exiled leader of the Cambodian opposition and former minister of finance. This piece originally appeared in French in Libération. 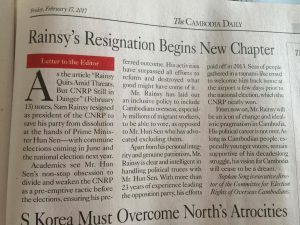 As the article “Rainsy Quits Amid Threat, But CNRP Still in Danger” (February 13) notes, Sam Rainsy resigned as president of the CNRP to save his party from dissolution at the hands of Prime Minister Hun Sen-with commune election coming in June and the national election next year. Academics see Mr. Hun Sen’s non-stop obsession to divide and weaken the CNRP as a pre-emptive tactic before the elections, ensuring his preferred outcome. His activities have surpassed all efforts to reform and destroyed what good might have come of it. Mr. Rainsy has laid out an inclusive policy to include Cambodians overseas, especially millions of migrant workers, to be able to vote, as opposed to Mr. Hun Sen who has advocated to exclude them. Apart from his personal integrity and genuine patriotism, Mr. Rainsy is clear and intelligent in handling political truces with Mr. Hun Sen. With more than 23 years experience in leading opposition party, his effort paid off in 2013. Seas of people gathered in tsunamic-like crowd to welcome him back home at the airport a few days prior to the national election, which the CNRP nearly won. 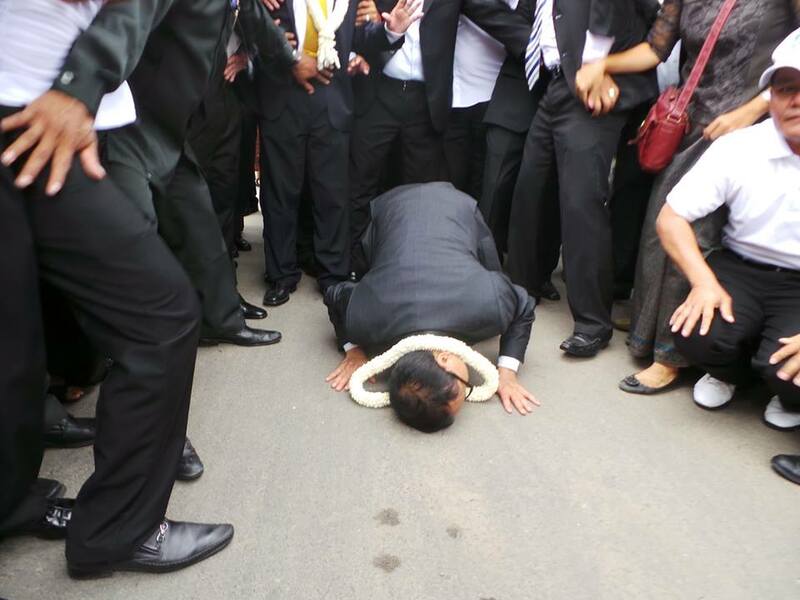 From now on, Mr. Rainsy will be an icon of change and idealistic pragmatism in Cambodia. His political career is not over. As long as Cambodian people, especially younger voters, remain supportive of his decadeslong struggle, his vision for Cambodia will cease to be a dream. The most popular news during these few days is the resignation of Sam Rainsy from Cambodia National Rescue Party’s presidency and membership. There are many views on pros and cons of his journey. Cambodian people in general are missing him so much for his decision-making but their love and attachment towards his heroic determination has been surprisingly increasing. 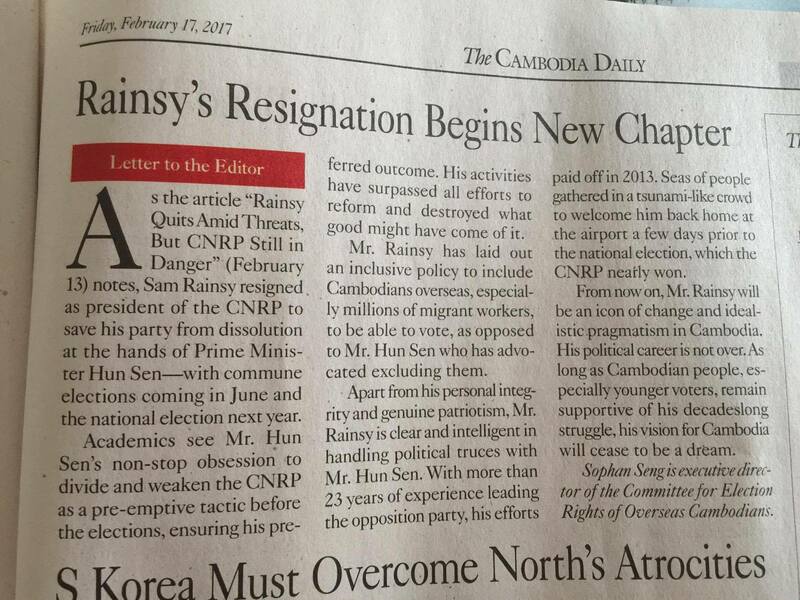 Hence, some analysts viewed his resignation as a disadvantage for both himself and the CNRP as whole. 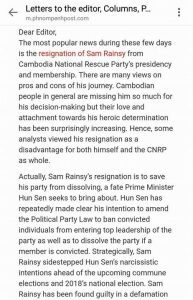 Actually, Sam Rainsy’s resignation is to save his party from dissolving, a fate Prime Minister Hun Sen seeks to bring about. Hun Sen has repeatedly made clear his intention to amend the Political Party Law to ban convicted individuals from entering top leadership of the party as well as to dissolve the party if a member is convicted. 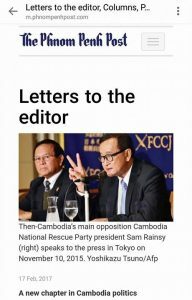 Strategically, Sam Rainsy sidestepped Hun Sen’s narcissistic intentions ahead of the upcoming commune elections and 2018’s national election. Sam Rainsy has been found guilty in a defamation lawsuit against him and there are many more lawsuits against him. Every Cambodian knows that those charges are politically motivated. Academics and observers see Hun Sen’s obsession to divide and weaken the CNRP as a pre-emptive tactic to ensure a positive outcome for the CPP in elections. This activity has surpased all efforts of reform. Jailing NGO staff members including secretary of the National Election Committee Ny Charia is seen as an attempt to tame the election body, and this latest effort to outlaw the strongest opposition party is seen as a move to weaken his opponent before allowing them to enter the ring. Besides personal integrity, honesty, sacrifice and love for his nation, Sam Rainsy has proved vivid and intelligent in handling political truces with Hun Sen. With more than 27 years of experience in political leadership in opposition to Hun Sen, Sam Rainsy was greeted by a sea of people to welcome him back home at the airport a few days before the election campaign kicked off in 2013. Some people believe his resignation is an example of irresponsible leadership. In fact, it is parallel to that of George Washington, who stepped down after serving two terms, despite the fact that many believed he could have ruled for life. He did this for the love of his country. Likewise, Sam Rainsy has shown to be the first role model to all Cambodian people, willing to cede power for the good of the people. In the future, Sam Rainsy will be an icon of change and idealistic pragmatism in the Kingdom. His political career is not yet over, and won’t be over so long as Cambodians, especially younger voters, are still supportive of his struggle.